An international team of scientists from the MINOS experiment at the Fermi National Accelerator laboratory (Fermilab) announced the world’s most precise measurement to date of the parameters that govern antineutrino oscillations, the back-and-forth transformations of antineutrinos from one type to another. This result provides information about the difference in mass between different antineutrino types. 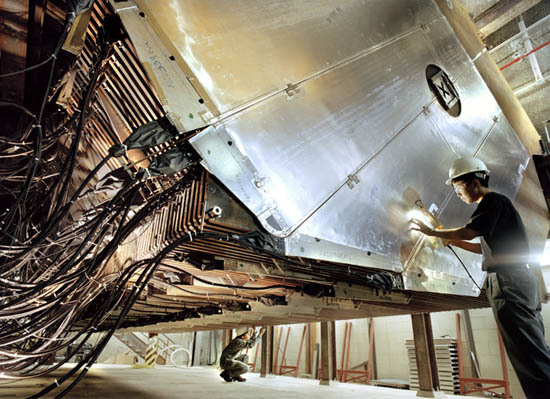 The measurement showed an unexpected variance in the values for neutrinos and antineutrinos. This mass difference parameter, called Δm2 (“delta m squared”), is smaller by approximately 40 percent for neutrinos than for antineutrinos. Neutrinos and antineutrinos behave differently in many respects, but the MINOS results, presented today at the Neutrino 2010 conference in Athens, Greece and in a colloquium at Fermilab, are the first observation of a potential fundamental difference that established physical theory could not explain.